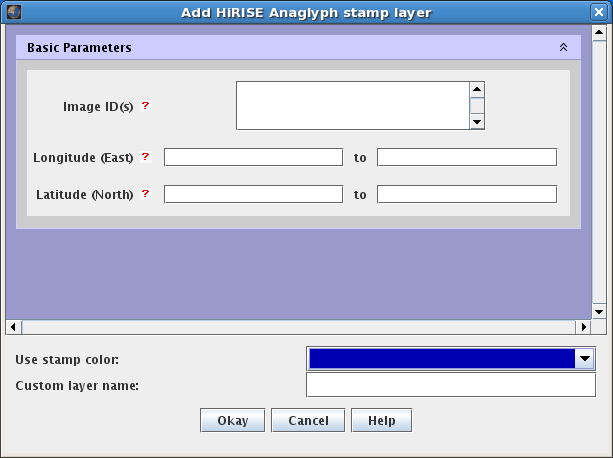 Open the Stamp Layer: Chose "Add New Layer" -> "Instument" -> "HiRISE Anaglyph". OR "Add New Layer" -> "Imagery: -> "HiRISE Anaglyph"
Enter Search Parameters: Since there are so few HiRISE Anaglyph products currently available, the only necessary search parameters are Image ID and Latitude/Longitude. The allowable values for each field are given in the quick reference table below followed by more detailed descriptions of each search parameter. Perform Image Search: Clicking OK will make the Stamp Layer perform the search and display the results. Once the stamps are displayed in the Viewing Window, users can right-click on an outline to either render the image (display the image data in JMARS) or view the image in a web browser.In either case, users can view the 3D anaglyph data using standard red-blue 3D glasses. 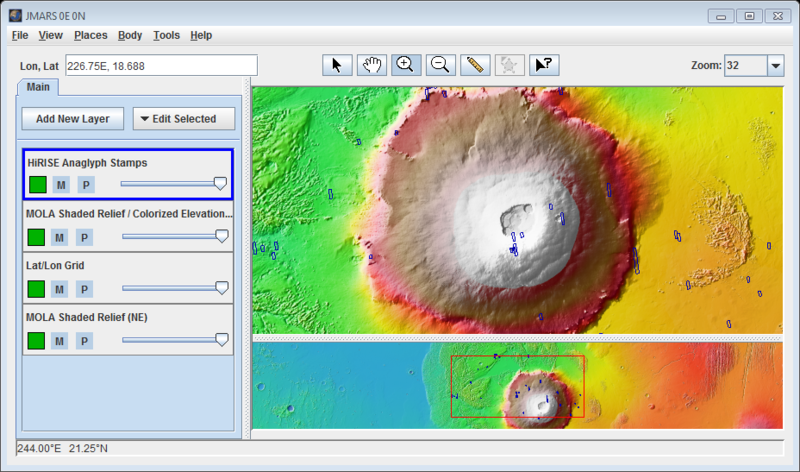 The HiRISE Anaglyph Stamp Layer's functions are identical to the functions of the Stamp Layer and are explained in detail on the Stamp Layer page.